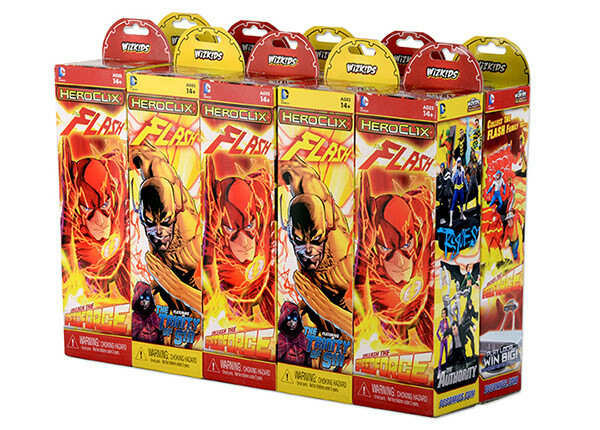 DC Comics HeroClix: The Flash Booster and Fast Forces Available now! Today sees the release of a new Heroclix set from Wizkids. The DC Comics HeroClix: The Flash set is out now including five-figure boosters packs and the DC Comics HeroClix: “The Rogues” Fast Forces pack. The Flash set features heroes and villains from the Flash universe including numerous individuals who have worn the uniform. The set includes a new function called Speedforce which allows figures to gain speed with tokens and spend the tokens in various ways. It’s a new dynamic sure to change up game play. The new Fast Forces back features six classic Flash foes including Mirror Master, Weather Wizard and Heat Wave along with two new maps of the Flash Museum (Indoor and Outdoor). Some shops are also celebrating the release with a special Release Day Organized Play event focusing on these boosters. You can find participating retailers through the Wizkids event system. Retailers hosting the Organized Play events will stock limited-edition prizes to distribute to winners of various categories. Make sure to visit ASAP to find out if your local HeroClix retailer is hosting an event!